Hey Guitarist, do you want to play with your own custom guitar picks? Make yours now in the designer and we make them for you. With your custom guitar picks you're ready for rock 'n roll!! Our print quality is up to 2880DPI, you never seen guitar picks with such a sharp print. 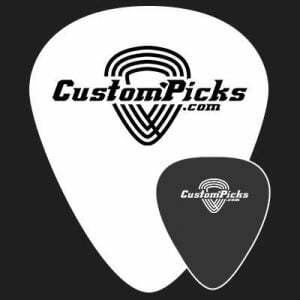 In the middle of the page you will find a designer tool to customize your guitar picks. Just upload your images or texts and position it, then select the amount that you would like to order and thickness that you play with. If you are done, click Add to cart and order the guitar picks custom. We will do the rest! You will receive a tracking code if the order is send. 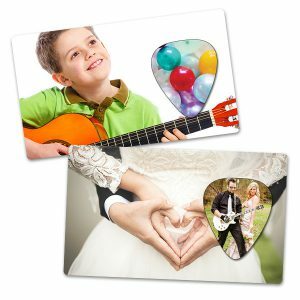 If you have any questions for ordering custom guitar picks or about our designer tool, please contact us for more information. 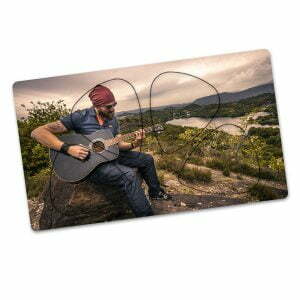 Hey Guitarist, do you want to play with your own custom guitar picks with double sided print? Make yours now in the designer and we make them for you. With your custom guitar picks you’re ready for rock ‘n roll!! Our print quality is up to 2880DPI, you never seen guitar picks with such a sharp print. 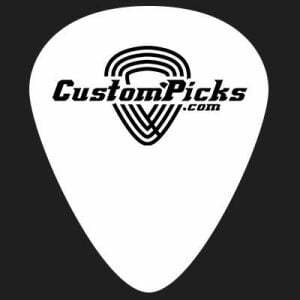 In the middle of the page you will find a designer tool to customize your guitar picks. Just upload your images or texts and position it, then select the amount that you would like to order and thickness that you play with. If you are done, click Add to cart and order the custom guitar picks. We will do the rest! You will receive a tracking code if the order is send. If you have any questions for ordering custom guitar picks or about our designer tool, please contact us for more information. These unique bracelets are developed and made by us (CustomPicks). We have made ‘only’ 100 of each design and are therefore limited. We are going to develop new bracelets every season with cool guitars or music related topics. 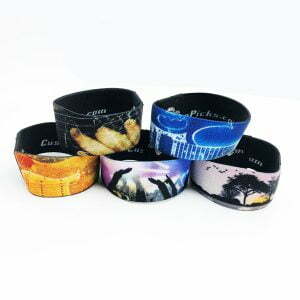 We have the bracelets in special Kids version, these are 14cm and adult size is 16.5cm. Because of this we hope that we will also wear the kids these cool and cool bracelets. Are you a guitarist that forget his guitar picks? You always have your custom guitar picks with you with our card picks. The card has the same size as all your other cards in your wallet. So it fits right in to your wallet!! In this card there's one single guitar pick which you can take out and put back in after you’re done playing the guitar. It’s really easy and you never loose your custom guitar picks again. In the middle of the page you will find a designer tool to customize your card picks. Just upload your images or texts and position it!. If you are done, click Add to cart and order the custom card picks. We will do the rest! You will receive a tracking code if the order is send. If you have any questions for ordering custom card picks or about our designer tool, please contact us for more information. Are you a guitarist that forget his guitar picks? You always have your custom guitar picks with you with our card picks. The card has the same size as all your other cards in your wallet. So it fits right in to your wallet!! In this card there’s one single guitar pick which you can take out and put back in after you’re done playing the guitar. It’s really easy and you never loose your custom guitar picks again. In the middle of the page you will find a designer tool to customize your card picks. Just upload your images or texts and position it!. If you are done, click Add to cart and order the custom card picks. We will do the rest! You will receive a tracking code if the order is send. If you have any questions for ordering custom card picks or about our designer tool, please contact us for more information. Are you a guitarist that forget his guitar picks? You always have your custom guitar picks with you with our card picks. The card has the same size as all your other cards in your wallet. So it fits right in to your wallet!! In this card there are 4 picks which you can take out and put back in after you're done playing the guitar. It's really easy and you never loose your custom guitar picks again. In the middle of the page you will find a designer tool to customize your card picks. Just upload your images or texts and position it!. If you are done, click Add to cart and order the custom card picks. We will do the rest! You will receive a tracking code if the order is send. If you have any questions for ordering custom card picks or about our designer tool, please contact us for more information. Hey Blues guy, do you want to play with your own custom vintage guitar picks? Make yours now in the designer and we make them for you. 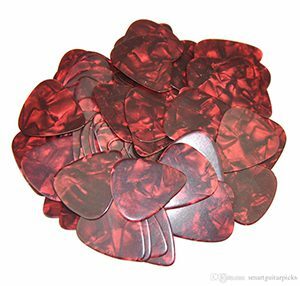 With your custom guitar vintage picks you’re ready for rock ‘n roll!! Our print quality is up to 2880DPI, you never seen vintage guitar picks with such a sharp print. In the middle of the page you will find a designer tool to customize your vintage guitar picks. Just upload your images or texts and position it, then select the amount that you would like to order and thickness that you play with. If you are done, click Add to cart and order the custom vintage guitar picks. We will do the rest! You will receive a tracking code if the order is send. If you have any questions for ordering custom vintage guitar picks or about our designer tool, please contact us for more information. Do you slide your plectrum while playing from your hands? Then we offer a beautiful new option “Special Grips”. Choose from the different grips your favorite and you will notice the difference immediately while playing. The plectrum has more grip and falls out of your hand less quickly. Special grips with own image! We print the grip with a special ink on the plectrum. As a result, it becomes a whole with the print and you almost do not see it. You really feel and it goes. Red stripes? No! The grips are made extra striking with the color red. In fact, this is a transparent layer that is printed more over the plectrum and here you see almost nothing. It is for illustration to indicate what grip is exactly.